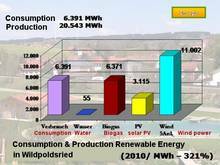 In 2010, 20,543 MWh of electricity was generated from renewable sources within the municipality. Electricity consumption in the municipality was 6,391 MWh. 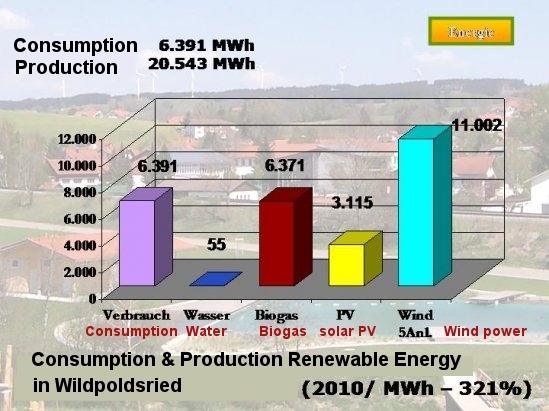 Renewable energy development began in Wilspoldsried in 1997 with the aim of developing new local, revenue producing industries that would add no debt. After 14 years. 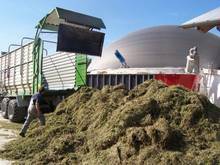 the Bavarian tow of 2600 people already produces more than three times the electricity that it needs with local renewable resources. The annual income from selling excess renewable electricity to the national grid is 4.0 million Euros (US $5.7 million). An additional economic benefit from the town's renewable energy choices is the that small renewable energy installation businesses are thriving. As of 2011, the town is reported to have installed nine new community buildings with solar panels, 190 private solar systems, three small hydro power plants, four biogas digesters with a fifth one under construction, and seven windmills---soon to be nine. 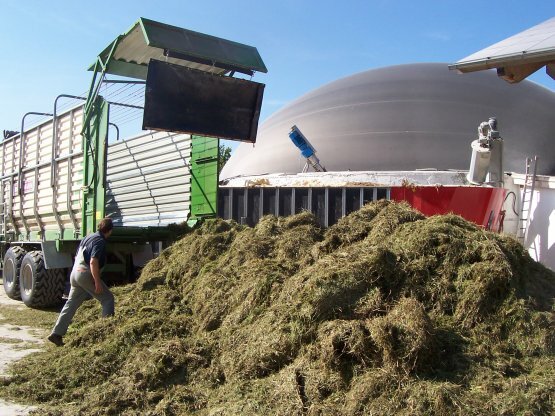 Additionally, 42 buildings in the village are heated by a system fueled by a combination of biogas and local wood waste pellets, which in 2010, replaced 220,000 liters of heating oil and eliminated nearly 600,000 kg (nearly 1.5 million lbs.) of CO2. To wean its transportation system off of fossil fuels, Wilspoldsried has set up a free car sharing system and a pilot testing program for electric cars. The town plans to also soon offer electric bicycle and electric car rental. 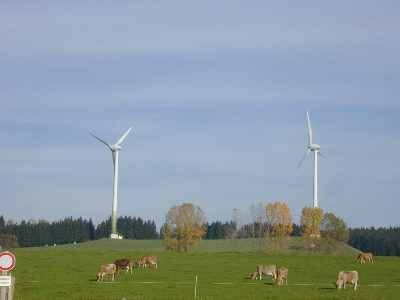 Wilspoldsried aims to supply all its energy demands with 100% renewable energy by 2020. The town's energy transformation has attracted a new tourism industry, which in turn, has inspired the construction of a sustainable energy training center built with passive solar design that is set to open in 2012. Wildpoldsried aspires to be a model for other towns that want to become climate friendly energy leaders and has received numerous awards for this efforts.